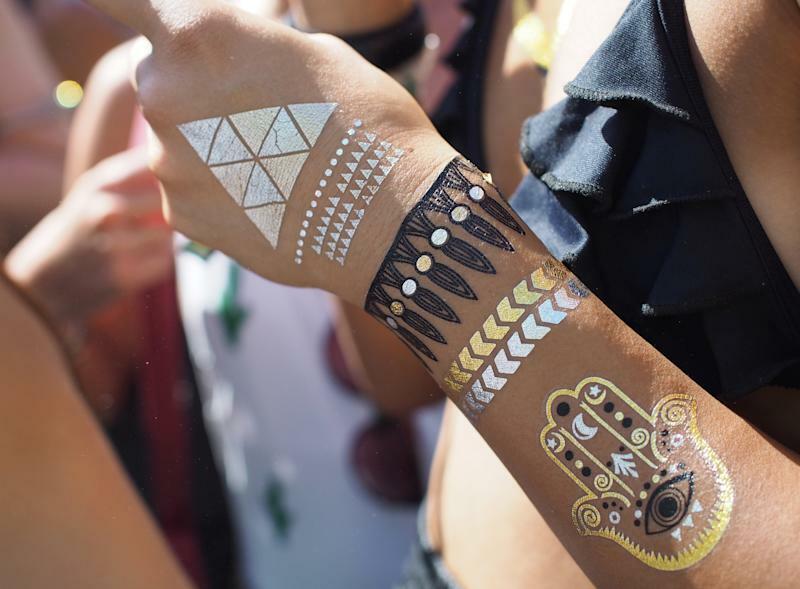 Among the style statements inspiring Coachella envy across the web this past weekend were some of the particularly amazing body tattoos and makeup on show. Inking, painting, or simply sticking glittery sprinkles onto your skin has never been a more stylish way to make a summer makeup statement. From the whimsical to the geometric, face and body painting is hot news right now. The opening Coachella weekend saw celebrities including actress Kelli Berglund and Brooklyn Beckham sporting temporary body art to get into the festival spirit. The "Lab Rats" star was spotted with a gold foil leaf design on her back, while the budding footballer opted for a fleche-shaped monochrome design on his neck. The most popular way to achieve the look at the moment is via flash tattoos, which are temporary metallic foil designs. Brands such as Flashtat.com are popular (Beyoncé is said to be a fan) but Sephora also stocks a selection with prices starting at $22. If you're interested in creating your own designs then vlogger SecretLifeOfaBioNerd has made a tutorial explaining everything you need to know to make your own flash tattoos using tattoo paper, gold leaf paper and water. She also recommends using liquid bandage for those annoying moments when the tattoos start to curl up at the corners. Of course, the look isn't restricted to the body. If you want to add some sparkle to your face makeup then follow beauty vlogger Chloe Morello's advice and use nail glitter flakes sprinkled across cheek or browbones for a shimmery, other-worldly effect. Facial gems can also be used to great effect, as makeup artist Heidi Hamoud demonstrates in this Coachella tutorial.